All skaters begin in the Learn to Skate program. Classes are offered from pre-kindergarten (both girls & boys) through adult in basic skating skills and beginning hockey. Registration with SCFSC is open year round, skaters can begin at anytime. Classes are managed on a quarterly basis - Summer, Fall, Winter, and Spring. The typical cost is $15 per session and skaters can choose to participate 1-2 sessions per week. We offer discounts for multiple family members. 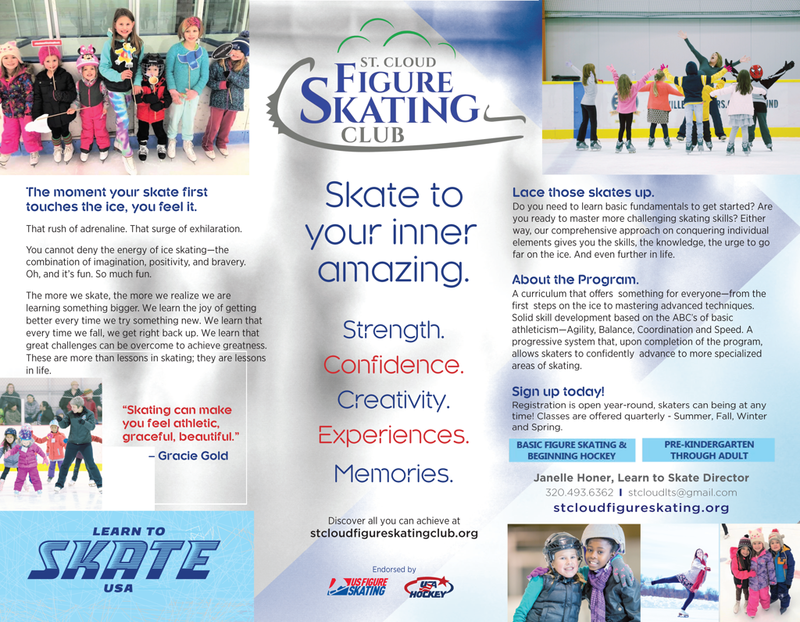 All skaters MUST register as a member with Learn to Skate USA prior to registering with the SCFSC Learn to Skate program. An annual membership is due upon beginning LTS and renewed annually (July 1). The membership cost is $16. The link to Learn to Skate USA is HERE. You will need your LTS USA membership number when registering for the SCFSC program. You can find the Learn to Skate calendar and entire club events calendar on the Home Page of the club website or by clicking HERE. All classes are held at the St. Cloud Municipal Athletic Complex (MAC). Please check the calendar on the home page often as there are periodically changes in ice times and classes. 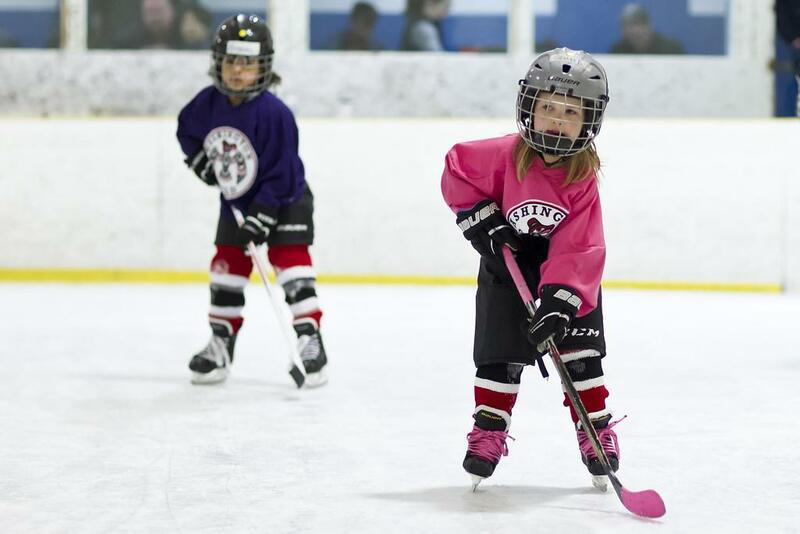 Spring Learn2Skate and Beginning Hockey Skills and LTS Plus Registration is now OPEN! Early Bird discount - register by Monday, March 24th and receive $10 off regular cost of participation. Multiple family members receive a 10% discount. Cost is approximately $15/class. Payment can be made in full or split in two payments, half due at time of registration and the other half due May 15th. Spring Learn2Skate begins the first week of April and goes through May. Sessions are one hour in length and are offered on Monday and/or Thursday evenings. See the calendar here. If your skater is interested in progressing at a faster rate, it will help be beneficial to skate both days of the week. Skaters who register for both days, receive 50% off the second day. Check out the dates and information here. What is LTS+ and transitioning to Freestyle Ice - It's a 1 year transition period between our Learn to Skate (LTS) program and our freestyle program. You get one or two LTS class session a week with one session of Freestyle ice. The Freestyle sessions are on the club calendar. You must hire a private coach for your lesson on freestyle ice. Your coach and you will decide which day and time works best for your skater’s private lesson. The coaching fee is separate from the purchased LTS+ program. How do I register for LTS+? Registration for LTS+ is the same as LTS but when you are selecting which LTS day you want to skate you also choose the option that says Plus. Is there a membership associated with LTS Plus? Yes. On our website you would go to Memberships under the Join Us tab and register your skater for the Introductory Membership. After one year in LTS+, you must move to either X-Skate Low or High and the freestyle program. Go to the contact us tab on our website, meet the coaches and all freestyle coaches are listed. Contact one of them to secure your private lessons. What happens after the year? Your skater will move into our freestyle program. You can choose between X-skate low or high. The low program is 3 sessions a week and high is unlimited (between 9-12) session a week. Anytime after Basic 5 and the skater is ready to advance their skating skills. Who decides when the skater is ready? The LTS coaches and director will help you make that decision. You can either ask them or the director will contact you.